SYRA Arts is pleased to present for the first time at the gallery an acclaimed artist from Armenia. “Metamorphosis,’ by Gagik Ghazanchyan is curated by Shahrooz Shekaraubi. Gagik Ghazanchyan was born in 1960 in Yerevan, Armenia. He is a graduate of the Terlemezyan Fine Arts College, as well as the Fine Arts and Drama Institute in Yerevan. A member of the Armenian Artists’ Union in Yerevan since 1992, Ghazanchyan has participated in exhibitions in the United States, Europe, the Middle East and Russia, winning great acclaim internationally. 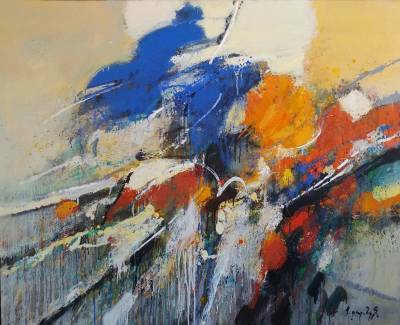 “Gagik is a reliable player in our contemporary art scene. His works carve a specific niche in many collections. His art doesn’t narrate or strive for a literary effect, but is peculiar, akin to those, who value art for itself. Neither sudden impulsiveness, nor stunning flights of fancy can be observed in his art. He is a self-sufficient person, who has felt no need to surprise with outward effects and innovative tricks. He follows his own route without hustle and bustle. "The color quality of his paintings reveals both the artistic nature of the artist and the human will. His extensive perception of the modern world is beyond the limits of national self-expression. He goes far beyond the adaptive approach that is shown by many artists. Today's ascetic problems are able to formulate a clear, well-known man of the twenty-first century. But at the same time, he cannot overlook the concerns of his native Yerevan. He is the flesh and blood of this city and the whole spectrum of drama and love that he has here can turn into a poetic poetry that is individually unique to a few in today's intellectual crisis in Yerevan. Painter Gagik Ghazanchyan is a fast vector aimed at tomorrow's culture. " The starting point: the moment when the present arises between the past and the future; a realistic perception of the unreal on the brink of the apparent reality. The result: a relativity realization of permanent movements and the rise of a tension limited only through the clash between consciousness and sub-consciousness. The emotion: while accepting the materiality of the non-existent, to feel, at the same time, the unreality of its existence. SYRA Arts: Based in Washington DC and Cairo, SYRA Arts is a contemporary art gallery dedicated to presenting Middle Eastern and Iranian artists and designers. Founded by art collectors, Sylvia Van Vliet Ragheb and Randa Fahmy Aboul-Nasr, the gallery presents a dynamic program of exhibitions with an emphasis on fostering long-term relationships with both emerging and established artists. Reaching out to art lovers, collectors as well as institutions around the world, SYRA has expanded its programming by organizing exhibitions in satellite locations around the United States. We believe that by introducing artists’ work in different cultural spheres around the globe we can facilitate a process of cultural exchange, thereby raising awareness and understanding between the varied heritages. Shahrooz Shekaraubi: Born in 1985, Shekaraubi is an independent curator, poet and the founder & Director of the Aftab Committee.